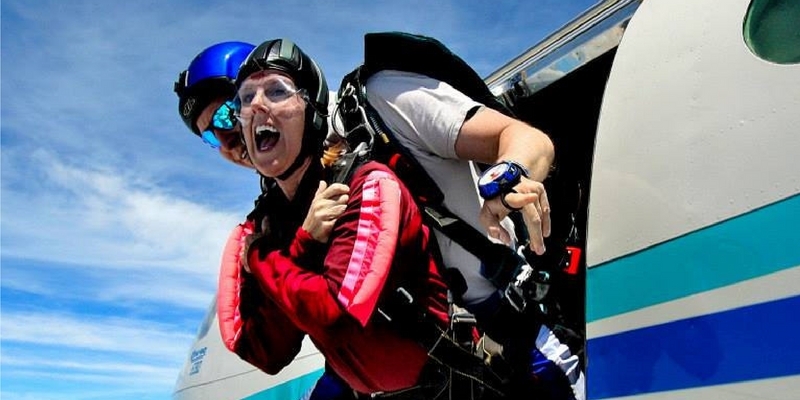 Is Skydiving Fun or Scary? First, let’s start with a universal truth: If you’re not feeling at least a little bit afraid of what lies before you when you jump out of a plane, something is very wrong. It’s natural to be a little–even a lot–scared. Here’s the thing, though: Once you’re past the initial fear of the unknown, skydiving is not as scary as you think it will be. It’s Scarier In The Plane Than It Is In Freefall. Everyone who has done a skydive will tell you this, so go ahead and ask: it’s the time that’s spent in the plane on the way up that has your palms sweating, especially the moment you stand at the door of the airplane and come to physically face the unknown. Embrace that fear, though, because it makes the triumphant landing incredibly exhilarating. You Won’t Feel What You Think You’re Going To Feel. The feeling of freefall is something of a surprise to everyone, the first time you’re in it. First-time skydivers go into it thinking that they’re going to have an overwhelming sense of speed–a stomach-dropping “falling” feeling–the in-your-face sensation of ground rush at 120mph. The truth? You feel none of that. You feel the air supporting your body and limbs from below. You see the world spread out around you like a blanket. You hear the whoosh of wind. You feel the comforting presence of your tandem instructor behind you. If you’re a smart cookie and have booked an outside video operator, you’ll be looking into the smiling face of one of our top-notch videographers, hovering just feet in front of you in the sky. Everyone Is Smiling In Freefall. If you look around, you’ll discover that it’s not easy to find images of people on a skydive who aren’t smiling. On the off chance you find one, it’s an anomaly–and usually, the rest of the photos of that person’s skydive are as smiley as everyone else’s. You Want To Be Scared In This Context. This one is the one that might be a little confusing at first read, but hear me out. Life gives us a lot of opportunities to square up to fear from an empowered place. When we’re kids, conquering fear happens almost all the time–when you learn to ride a bicycle, for instance, or go down a really big slide at the playground, or stand up to answer a hard question in the classroom. Facing these fears helps us to grow in the healthiest possible way. As adults, however, the frequency of fear’s teaching moments usually decreases from its frantic childhood rate. When it does, the “muscle” that we use to hold fear has a tendency to weaken as the years roll by. Sadly, that weakness means that we’re less capable of nailing the daily braveries that enrich our lives. Skydiving is a shortcut back to that childlike ability to see something you want, realize it’s scary, do it anyway, and bubble over with growth. It’s magic. You’ll see. The simple answer to the question, then, is this: skydiving is scary and fun, and that’s exactly the way it should be. Embrace the fear. We’re here to help you do it! Book your adventure and skydive Georgia with the highly experienced team at Skydive Monroe. Trust us, you’ll be glad you did.